"Dog diarrhea cures vary based on the underlying cause. For example, diarrhea caused by parasites requires specific medications for that condition, as opposed to problems caused by food allergy or intolerance. Antibiotics might also be needed if a bacterial infection has set in. If the cause is infection or irritable bowel then dietary change is needed. If you see blood in dog diarrhea, 5 to 8 episodes in a day or weakness, or diarrhea that lasts for more than 3 to 4 days, then be sure to consult with a veterinarian." Dog diarrhea can be caused by a number of things, and the appropriate dog diarrhea cures depend on the cause of the condition. If the diarrhea is acute or sudden, it could just be a brief episode that will pass once the food or toxins are removed from the body. If this is the case, no outside dog diarrhea cures are needed. When you take your dog to the vet for diarrhea, make sure you take a stool sample with you. Your vet can check it for parasites and for certain viruses like parvo. There are dog diarrhea cures which are medications (anti-motility drugs) that will stop diarrhea. They work by slowing down the movements of the intestines so that more water is absorbed and stool is less watery. They don't address the cause of the diarrhea, however. In fact, if the problem is that your dog ate something bad, anti-motility drugs can make the problem worse because they keep the "bad stuff" in the body for a longer period of time. Parasites, Roundworms, Whipworms, and other parasites: When you take your dog to the vet for diarrhea, make sure you take a stool sample with you. Your vet can test it for worms and other parasites. If parasites are present, these are treated with medication. If a dog is diagnosed with Giardia, in addition to prescription medications, the use of grapefruit seed extract for 10 to 14 days could be one of the helpful dog diarrhea cures used. Viral infections Viral infections are a common cause of diarrhea in dogs. Often these viruses are not serious and will pass in a few days. The only treatment available is supportive therapy, which consists of giving fluids if dehydration is a concern and keeping a close eye on your pet for a few days.Some viruses can be quite serious, however. One such virus is Parvovirus , which is characterized by yellowish diarrhea that is often bloody. Dogs should be vaccinated for parvo as puppies and receive annual booster shots. 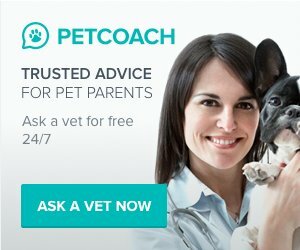 If your dog has not been vaccinated and shows signs of parvo, you should take him to the vet right away. Parvo is a very serious illness and can be deadly. Bacterial infections: It's often hard to know if it's a viral infection or a bacterial infection. There is no cure for viral causes of diarrhea. To be safe, your vet may prescribe antibiotics. Foreign Objects: Eating 'bad stuff.' Dogs will eat all kinds of things that they shouldn't eat. Sometimes it is garbage or rotten food. Other times it is inedible objects like sticks. Your vet may take an x-ray to see if there are any foreign bodies in your dog's digestive tract. If there are, surgery may be necessary. If, on the other hand, he just ate bad food or trash, diarrhea will help rid his system of the toxins and help him heal. Allergy: Allergic reaction can cause diarrhea. If this is the case, you should reduce your dog's diet to just chicken and rice. Stay with this diet and see if the diarrhea ends. If it does, gradually add other foods until you determine which one is causing the issue. An alternative is to use a diet such as Hill's Prescription Diet Z/D which is specifically formulated for dogs with food intolerance and allergy. 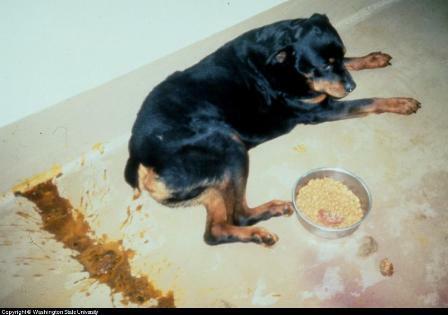 Dog diarrhea cures are needed for this Rottweiler due to canine salmon poisoning. It is difficult to determine if your dog's diarrhea is being caused by food allergy or a dietary intolerance. * Reaction to something in the food your dog eats such as caffeine, tyramine (chemical found in plants that are toxic to dogs such as mistletoe) or chocolate. The goal of dietary change for dog diarrhea cures is to maximize the ability of your dog to absorb the nutrients that he or she needs. Start by withholding food for a 24 hour period (provide a meat broth only to keep your dog hydrated). This fast will help to clear the dogs system. On the first day of the fast, only provide the meat broth you prepare. On the second day, introduce a simple diet consisting of a boiled meat such as chicken, combined with 1/2 to 2/3 rice. Lamb should be avoided since it is already a core ingredient in many commercially prepared foods. Fish is an excellent choice instead of chicken since it is not already in most commercial foods, providing an alternative to lamb based products that may have caused the problem. Instead of meat, wheat gluten is an excellent source of protein and has many properties that help with digestion (note that Irish Setters should avoid Wheat Gluten as this breed may have an adverse reaction). Continue with the simple meat/rice diet until the dogs stool is back to normal. At that point, transition back to the dogs normal diet. You might also want to consider adding Psyllium grain to the diet. It is soluble and Psyllium grains are a source of soluble fiber which can retain and absorb moisture. This is very helpful with diarrhea and constipation. Most veterinarians recommend a low fiber diet and then increase the level as your dog heals. Small quantities of carrots or psyllium could suffice. If your dog has a bacterial problem in the intestine then rice should be part of the diet as it is a digestible starch that works well in these situations. Since diarrhea is associated with the inability to absorb nutrients, a common symptom is weight loss, the coat losing its healthy look and poor skin quality. To increase energy your dog may need a higher level of fat in the diet. If this is the case, consult your veterinarian who can suggest an appropriate level of fat since fat increases absorption and energy, but can create digestive problems at the same time. If your dog is losing significant weight, then fat is probably needed. If you believe that a food intolerance caused the diarrhea, then an elimination diet is required. This starts the same way as described above, with a simple protein and carb such as rice. Once the dog's stool returns to normal, additional ingredients can be slowly added back into the diet each week, until dog diarrhea symptoms return. When symptoms return, it was caused by the last ingredient added. Alternative carbohydrates to rice include corn, potato, and tapioca. Another approach is to add food enzymes to your dog's diet as a way of aiding digestion. Enzymes that naturally occur in food are often destroyed when cooked. A supplement such as Solid Gold D-Zyme could be of help. You may have seen new human yogurt products in your supermarket advertising that they contain probiotics and prebiotics. These are "good" bacteria that in theory crowd out bad bacteria from the intestinal tract, in turn improving digestive health. In Europe, several forms of "good" bacteria (called Lactobacillus acidophilus and Enterococcus faecium) have been approved for inclusion in canine diets. There is little research available although preliminary work shows a positive effect. Prebiotics work by providing the healthy bacteria in the intestines with a "substrate" that helps them dominate the bad bacteria. There isn't a strong body of research that supports the use of this approach with dogs. Discuss this option with your veterinarian to see if there would be any harm or benefit in trying it. Many veterinarians recommend an elimination diet for dogs that are suffering from diarrhea caused by Canine Irritable Bowel Disease (IBD). Diets recommended are highly digestible by the body. 1. Fat Restriction - fat can cause bacterial growth in the intestines. A low fat diet needs to replace hard to digest fat with highly digestible fat such as vegetable oils, poultry fat and fish oil which contain omega-3 fatty acids. 2. Use Probiotics and prebiotics - some veterinarians prescribe yogurt rich in probiotics and prebiotics. Holistic veterinarians believe that natural medicine is an approach worth considering for the promotion of digestive system health and balance as one of the many dog diarrhea cures available. One such product, RuniPoo Relief despite its silly name is made for this purpose. It combines several ingredients that were selected to promote healthy bowel function. It is particularly good for dogs with sensitive digestive systems where bouts of diarrhea are common.